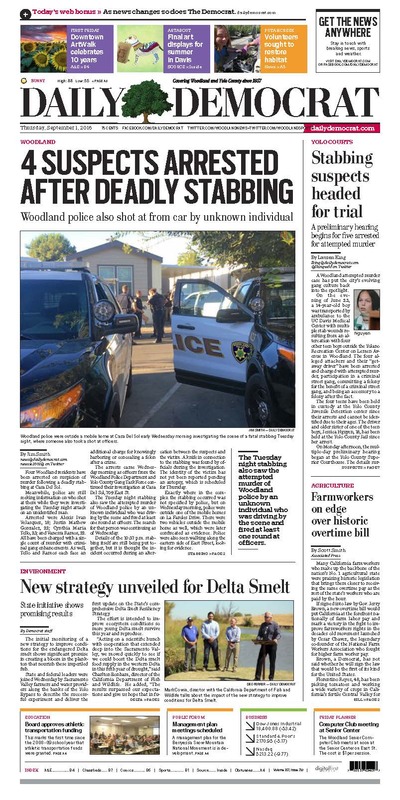 Published in print Tuesday through Sunday, The Reporter’s paid circulation provides coverage in Vacaville, Dixon, Fairfield and Winters. 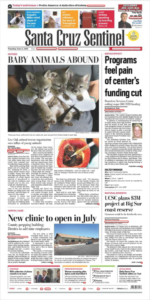 Published in print Tuesday through Sunday, the Daily Democrat’s paid circulation provides coverage in greater Woodland area. 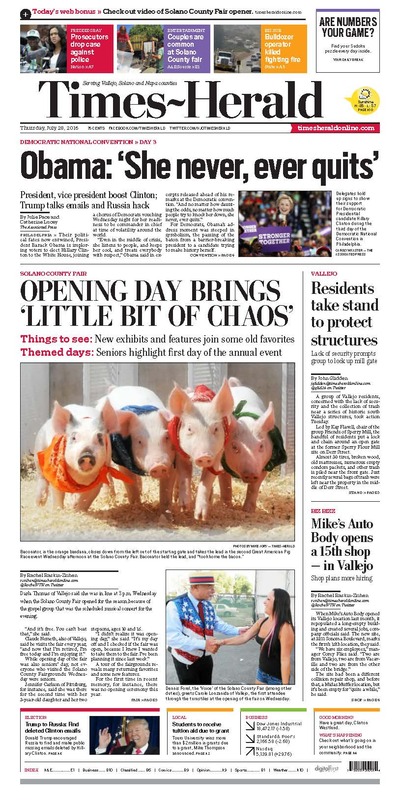 Published in print Tuesday through Sunday, the Times-Herald’s paid circulation provides coverage in Vallejo, Benicia and Fairfield. 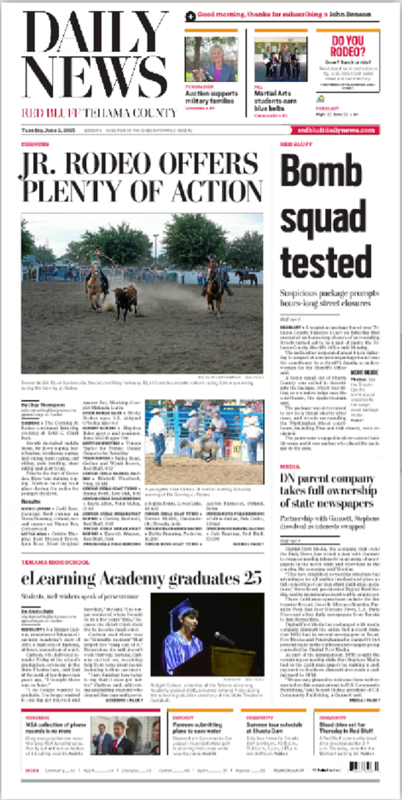 Published in print every day, the Enterprise-Record’s paid circulation provides broad county coverage in many towns including Chico, Paradise, Oroville, Red Bluff, Magalia, and Orland. 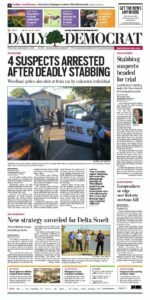 Published in print print Tuesday through Sunday, the Oroville Mercury-Register’s paid circulation provides broad county coverage in many towns including Oroville, Chico, Paradise, Red Bluff and Magalia. 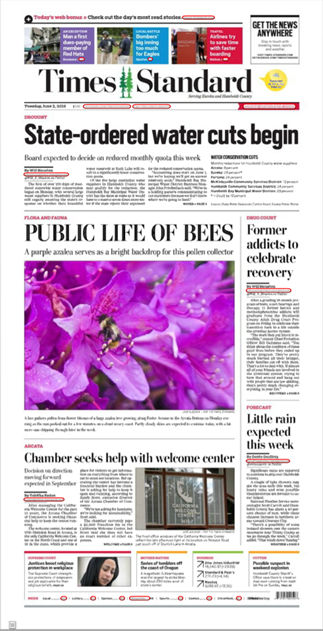 Published in print every day, the Monterey Herald’s paid circulation provides broad county coverage in many towns including Monterey, Carmel, Salinas, Carmel By The Sea, Marina, Pacific Grove, Seaside and Pebble Beach. 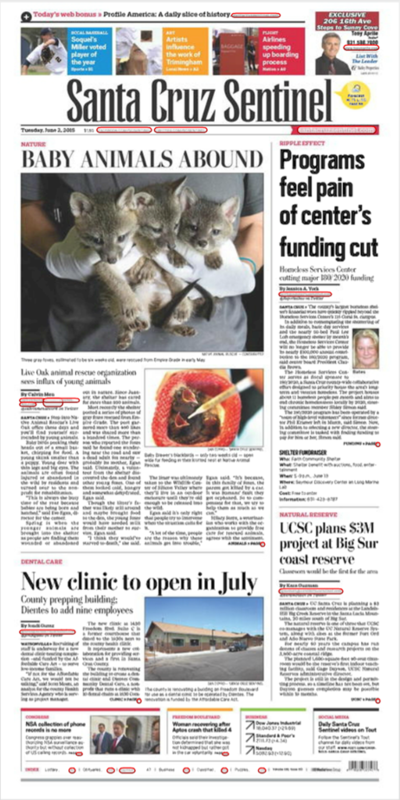 Published in print every day, the Santa Cruz Sentinel’s paid circulation provides broad county coverage in many towns including Santa Cruz, Watsonville, Aptos, Scotts Valley, Soquel and Capitola. 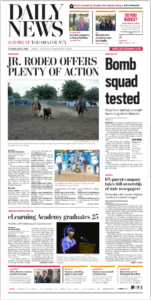 Published in print Tuesday through Saturday, the Red Bluff Daily News’ paid circulation provides coverage in Red Bluff, Corning, Gerber and Los Molinos. Published in print Tuesday through Sunday, The Ukiah Daily Journal’s paid circulation provides coverage in Ukiah, Redwood Valley, Willits Hopland and Potter Valley. 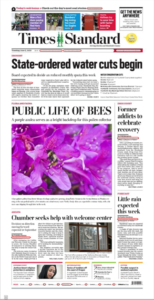 Published in print Tuesday through Saturday, the Lake County Record-Bee’s paid circulation provides coverage in Lakeport, Kelseyville, Clearlake, Clearlake Oaks, Lucerne, Nice, Upper Lake, Lower Lake and Hidden Valley Lake. 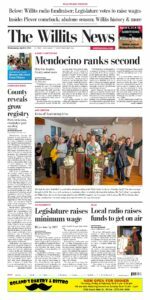 Published in print Tuesday through Sunday, the Times-Standard’s paid circulation provides broad county coverage in many towns including Eureka, McKinleyville, Arcata, Fortuna, Blue Lake, Ferndale, Rio Dell, Trinidad and Willow Creek. Published in print Thursday, The Mendocino Beacon’s paid circulation provides coverage in a broad area including Mendocino, Fort Bragg, Little River and Albion. 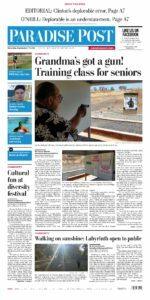 Published in print Thursday, the Fort Bragg Advocate-New’s paid circulation provides coverage in a broad area including Mendocino, Fort Bragg, Little River and Albion. 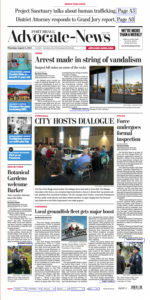 Published in print Thursday, The Willits News’s paid circulation provides coverage in the Willits area and nearby towns. 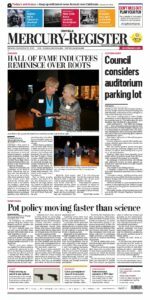 Published in print Wednesday and Saturday, the Paradise Post’s paid circulation provides coverage in Paradise and Magalia. 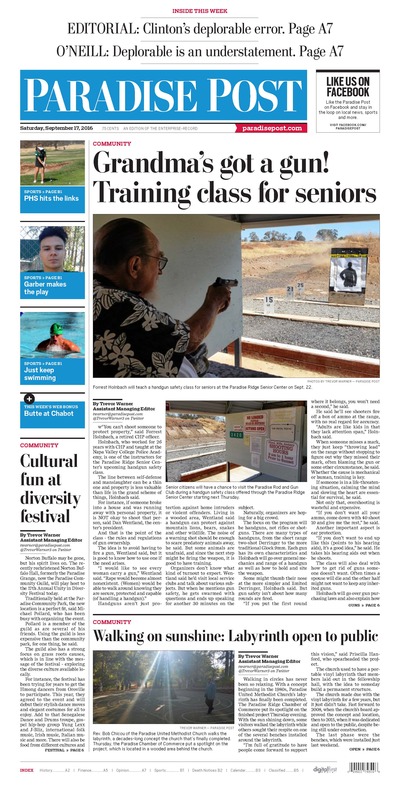 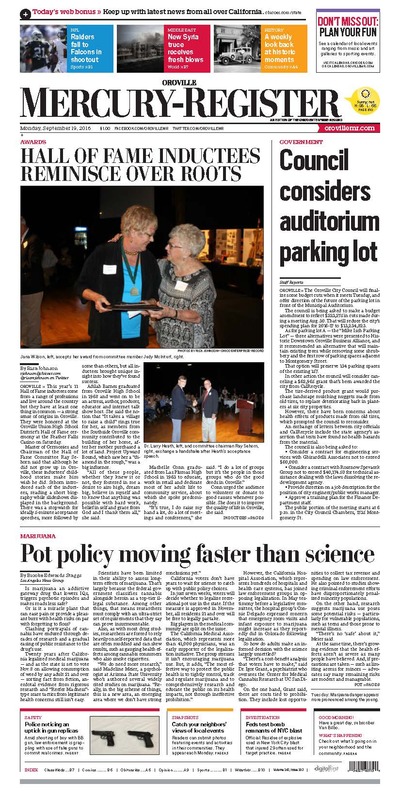 Published in print Tuesday, the Redwood Time’s distribution provides coverage in Redway and Garberville.